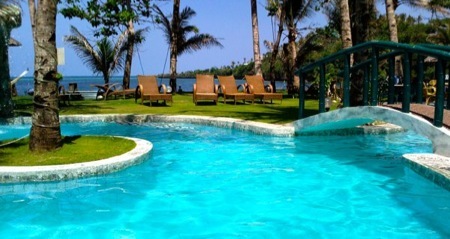 You can expect a pleasant private atmosphere in a picturesque, romantic and quiet bay directly on the Sibuyan Sea. „THE BEST KEEP SECRET IN BORACAY"
WHITE BEACH (named also as "little Mallorca"). Of course we also offer you a free Shuttle Service, if you choose not to walk. a rooftop Sundeck with a breathtaking Seaview is waiting for you. Our Swimming pool, with a small Island and a Waterfall, gives you the possibility to take your cocktail directly in the Pool at our Poolbar – a preferred place of our value guest.. The German Management is there for you (almost) 24 hours and will try to fulfill your every wish.